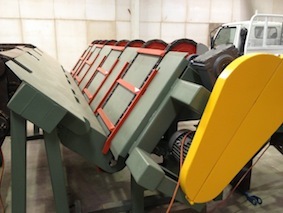 A short unscrambler designed to provide good presentation to down stream equipment. Well suited for inline production or bundle production. This unscrambler comes with adjustable ridge bars (air actuated) and has the ability to fine-tune it’s processing by adjusting the face angle (it is hinged at the top). This makes it suitable for specialized production situations. Price $74,000 negotiable. This is a very robust hook and accelerating wheel style lug loader. This unit comes in two types of accelerating arrangements: one is a lagged accelerating wheel feeding onto an accelerating roller chain and the other is an accelerating sprocket fitted with a sharp chain that becomes the accelerating chain. 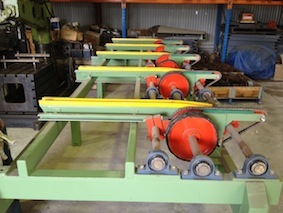 This type is used only on green timber but the other can be used on both. A major feature of this lug loader is the large, strong hooks. Price $42,000 negotiable.